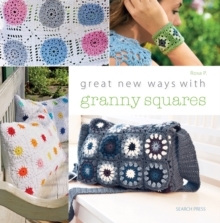 Granny squares are versatile, easy-to-make, charmingly retro and forever popular. These 20 trendy designs bring the classic granny square into the 21st century with a stylish appeal for a whole new generation of crafters. There are designs for every season including a floral chain curtain; a cuddly, warm poncho; throws; blankets; cushions and tablecloths all designed to lend your home an elegant retro flair. Step-by-step diagrams and instructions teach you all the basic techniques you need to know, and each project is accompanied by helpful crochet diagrams and easy-to-follow instructions. This book is perfect for the absolute beginner as well as for the more experienced crocheter looking for fresh ideas and inspiration.